Fred Meyer Weekly Ad Federal Way WA offers Colossal EZ peel shrimp raw, previously frozen 13-15 ct. Kroger cheese 12-16 oz. Fred Meyer cottage cheese or sour cream 24 oz., Fred Meyer butter 16 oz. Best foods mayonnaise 20-30 fl. oz. All laundry detergent 30-52 fl. oz. or 18-24 ct. pods or snuggle fabric softener, liquid 32-40 use or sheets, 70-80 ct. select varieties. See natural & organic brands including vitaminwater 20 fl. oz. or clif, luna or mojo bar, 1.41-2.4 oz. select varieties. Noosa yoghurt select varieties 5.5-8 oz. Califia farm almond milk select varieties 48 fl. oz. Tom's of maine toothpaste 4-5.5 oz. or deodorant 2.25 oz. select varieties. Boom chicka pop popcorn select varieties 4.4-7 oz. Clean & tidy! Get household essentials products such as Clorox bleach select varieties 116-121 f. oz. Tide liquid laundry detergent 46-50 fl. oz. or Downy fabric softener 62-77 fl. oz. select varieties. Charmin bathroom tissue 6 mega rolls or bounty paper towels 6 big rolls select varieties. Swiffer 2X refills select varieties 6-32 ct. Nature made vitamins select varieties 12-300 ct. Plum Baby food 3.5-4 oz. Softsoap body wash select varieties 7.5-18 fl. oz. Softsoap liquid soap select varieties 7.5 fl. oz. Nivea in shower lotion select varieties 13.5-16.9 fl. oz. Good hair accessories select varieties 1-250 ct. Edge or skintimate shave gel select varieties 7 oz. Kroger allergy tablets 100 ct.
Luvs jumbo diapers select varieties 21-34 ct.
Don't forget to see produce for more savings. Pint Blueberries or blackberries 6 oz. Simple truth organic salad blend select varieties 5 oz. Organic braeburn apples, personal seedless watermelon, navel orange, cucumbers or radishes. View the full ad, plus more deals at Fred Meyer official website. 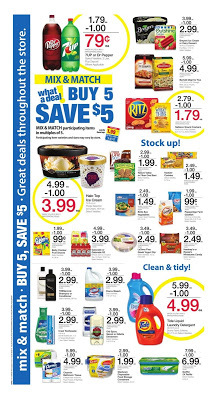 Always check this page for the latest Fred Meyer weekly ad circular this week!